You no longer need to go to the fun fair to have a session of Whack-A-Mole, as the USB Whack It offers such convenience at your desktop. Need a coffee break? 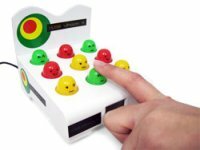 Whack the characters when they light up to get a high score in this frantic desktop game. It can be powered via USB or using batteries, but unless you work in a really old fashioned office with not a single USB port in sight, the USB Whack It ought to receive plenty of hard, loving attention from you while you cross your fingers and hope for the clock to strike 5. Are there better ways to de-stress yourself with a mere £11.95?